RIR presents the five most interesting innovations that were on display at a Defence Ministry exhibition in Moscow this week. 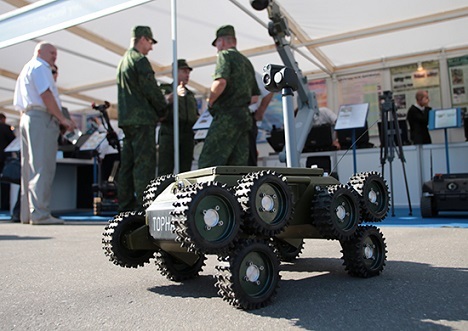 On August 20, an exhibition titled “RF Defense Ministry Innovations Day,” was held in Moscow. It was the first to showcase cutting-edge defence developments. More than 250 participants assembled on the grounds of the CSKA Light-Athletic Football Complex, where they presented advanced developments designed for introduction into the Russian Armed Forces. We present the 5 most interesting innovations from exhibition. An inflatable tank – the mock-up T-80 - was situated directly outside the entrance to the complex where the exhibition was held. According to the manufacturers, such objects are used for misleading enemy reconnaissance. Similar “tanks” are already being produced in China. However, the Russian model offers a number of advantages over the competitor’s. The inflatable T-80, in contrast to analogous Chinese versions, is “leaky,” which means the Russian “tank” does not deflate if there is mechanical damage. In addition, the fake tank has parts that warm up in the engine and exhaust area where heat would be detected on a real tank. This helps to trick the infrared detection equipment of enemy scouts. The inflatable tank fits easily into a small pouch and can be unfurled in ten minutes with a special pump. An exoskeleton of Russian manufacture was one of the first inventions presented before the soldiers’ court. The apparatus enhances a person’s capabilities, making it possible for him to haul up to 100 kilos of weight while putting minimal stress on the body – all without the use of electricity. “The mechanical knee joints lock at the moment of motion. As a result, all of the weight that once fell on the individual now presses on the device, completely bypassing him,” explained the Director of the Laboratory for the Development of an Exoskeleton, Aleksandr Formalski. Taking on the weight of a soldier’s equipment and weapons, such an apparatus makes fighters several times more mobile and hardy. At the exhibition soldiers tested the complex tactical simulators of the Logos mechanised infantry company. They already underwent state testing in December 2012 and are currently being prepared for introduction into the army arsenal. “It is a good help to a commander in training his subordinates for tactical actions on the field. It makes it possible to train soldiers before they enter the field or are given weapons,” said Senior Lieutenant Evgeni Derevjankin, sharing his impressions while personally testing the new development. The simulator is offered in two versions: computer and iron, which fully mirrors the situation in a combat vehicle. Argus-Spectrum developed the Sentinel bracelet, which serves as a warning device, and presented it at the exhibition. According to the developers, if a person wearing the bracelet stops moving or is kidnapped, a signal reaches headquarters with this information. If he sees someone suspicious approaching, he can press the bracelet’s panic button. Russian Defence Minister Sergei Shoigu has already ordered military units covering the Caucasus to wear such bracelets in preparation for the Olympics in Sochi. The Defence Minister was especially impressed that the new product could ensure the security of ordinary conscripts as well as professional soldiers. Yet another military innovation presented was the Mantos fire-extinguishing gel cape. “At the moment there is not a single army equipped with these gel capes. These make it possible to extinguish Class A (burning solids) and B (burning liquids) fires,” stated Marianna Skragan, the development director for Complex Security Technology company. She added that the cape can put out a flame on a person in two seconds flat. This product may also be used to extinguish fires in the engine compartments of military equipment. Sergei Shoigu has already proposed equipping all Russian tank crews with such capes.